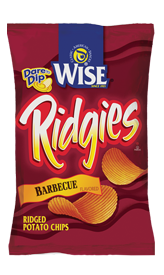 The Ridged nature of these Chips meant a thicker than regular Chip was required to sustain the challenge of remaining whole. This in turn created a softer than Kettle Cooked, but more rigid than Regular Chip crunch. This crunch quickly turned soft after the hard breaking noise. There were a few broken Chips in our bag and most appeared a little on the small side. However, they also featured a strange texture. They were thinly Marcelled and flat. There were the odd curved or bent, highly dippable propositions in the bag but most looked as though they had been smoothed with a ridged flat iron. There were brown edges and browning on some Chips, and there was notable seasoning; a sort of darker reddish brown than you often see on Barbecue Chips. Unlike most Barbecue Chips, our Nose Plunge Test did not reveal much of an aroma. There was maybe a hint of Barbecue. Our minds may have played tricks but this did not taste like the same recipe that Wise use on their standard Barbecue Chips. These had a rounded and well established Barbecue flavoring that packed a little peppery heat. Certainly an improvement, but also a nicer tasting Chip than its regular counterpart.